Ever since I moved to London, I’ve cut down on my beauty spend, because whilst I love the city, I hate its rent. That being said, once a beauty junkie —always a beauty junkie. There’s simply nothing you can do about that, eh? These are some bits that I’ve accumulated over the past few months. Some are new to the market, others are new to me, but have been well loved and gained a ‘cult-classic’ title already. La Roche-Posay’s Hydraphase Intense Serum has been launched for a few weeks now, and is basically the French pharmacy’s answer to Hyaluronic Acid serums. It is a very light gel that you should wear underneath a moisturiser or facial oil. I like that it comes in a pump and like all Hyaluronic Acid products —I don’t have a bad word to say really. Plumps my skin up and keeps it hydrated. A big thumbs up from this gal over here. Another skin plumping product is Evolve Beauty’s Miracle Facial Oil. It’s made from a beautiful blend of Organic Rosehip, Argan and Nigella Oils —making it soothing, nourishing and repairing at the same time. Whilst it’s a richer oil, it’s really easy to blend into the skin and I reach for this when my skin is really dry and parched. On days when I opt for a lighter oil, SkinOwl’s Beauty Drops PM Mangosteen comes to the rescue. I’ll do a full review on this once I’ve tested this for a longer period, but so far so good! 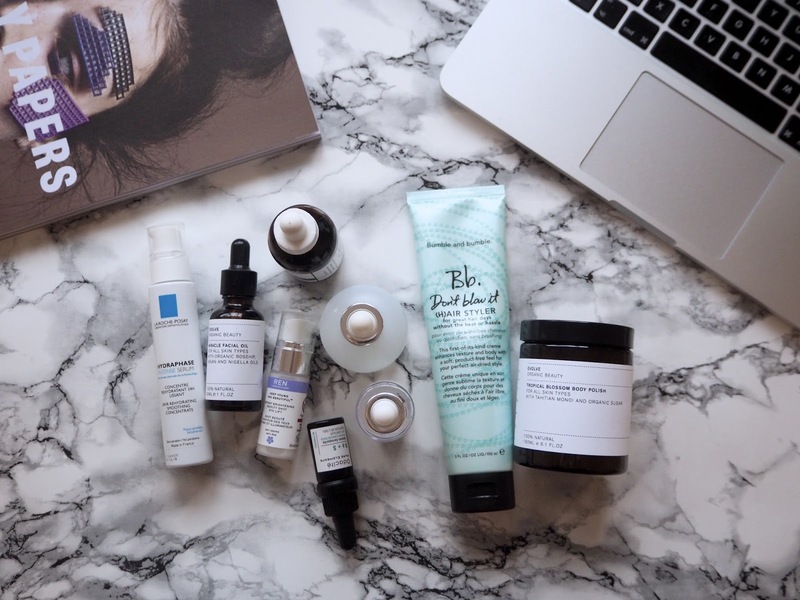 Jumping back to treatments and serums, I’ve been testing some Korean skincare products that are loved by the K-Beauty community. Lee Ji Ham’s (LJH) Tea Tree 90 Essence is a fave of Tracy and when I saw this on offer, I went for it. It contains 90% Tea Tree essence and whilst that sounds really intense, it’s actually really gentle and doesn’t smell like Tea Tree AT ALL. It’s quite watery and sinks into the skin really easily. I’ve not used this long enough to say whether I’m seeing the effects already, but I think it does calm my skin and brings down the redness of my hyper pigmentation slightly. The treatment that I’ve been alternating to directly treat my hyper pigmentation is Klairs’ Freshly Juiced Vitamin Drop, which contains Vitamin C. I’ve only been using this on a regular basis (every other night) for the past week, so I’ll report back on this one soon. Though reviews within the community have made my expectations rather high! When it comes to skincare, eye treatments are the least on my mind —I know it’s bad… However, I did notice that my eyes are starting to get drier, so I’ve tried to proactively care for that area a bit more. I love Odacité’s Boosters and their Baobab-Sarsaparilla (Ba+S) Eye Contour certainly doesn’t disappoint. Instead of mixing it with an eye cream, I apply one small drop directly onto my eye area. I tend to use this in the evening so I’m sure my concealer doesn’t slip away. I’ve been using REN’s Instant Brightening Beauty Shot Eye Lift in the mornings and whilst I’m not sure how lifting it is, I can definitely attest that it tightens my eye area immediately. It’s a really light gel that is very hydrating and keeps my eye area looking freshhhh. Whilst you can rarely see me ranting about eye creams, it’s even more rare to see my rave about hair care. 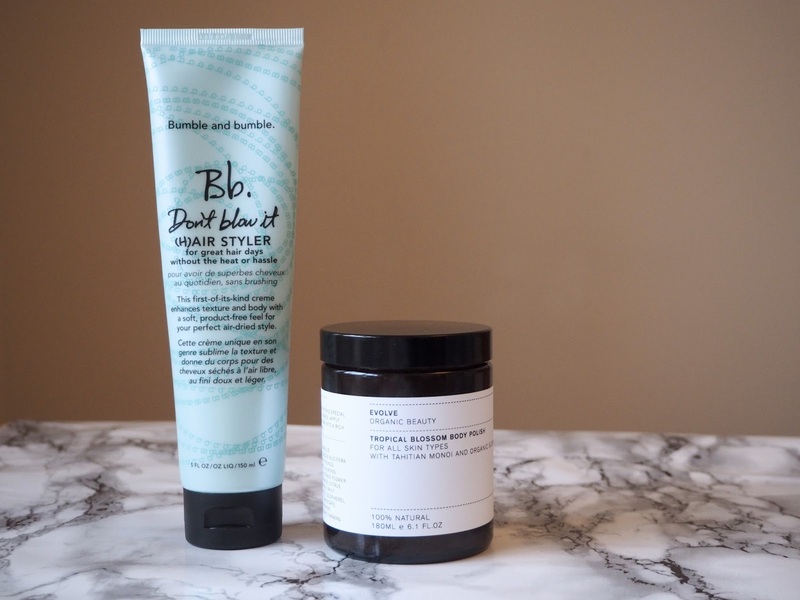 Bumble and Bumble’s Don’t Blow It has been on my radar ever since it launched months ago, but I wasn’t sure whether it’d be something that’d work for me. Styling products tend to make my already-sensitive-super-prone-to-oil scalp even oilier, but as I’m trying to grow out my hair it was starting to look very… limp. BUT boy, am I happy to report back this is the first hair styling product I actually LOVE. Requires zero effort and results in added volume. And lastly, but certainly not least is Evolve Beauty’s Tropical Blossom Body Polish. I love body scrubs as they’re such a treat and make me feel amazing. I’ve only tried this once, but the the texture isn’t too rough and it smells amazing. I’ll definitely be using this often now ‘spring has sprung’ and (hopefully) it’ll be bare leg season before you and I can say fake tan sesh.